From August 22 to 24, the largest summer sporting event will happen in Vermont — and it’s not baseball or boating. It’s tennis, bringing some of the tour’s top male players to the Green Mountain State on the eve of the U.S. Open in New York City. This week, Seven Days lobbed a few questions at Ross about the Stowe Mountain Lodge Tennis Classic. SEVEN DAYS: How did the event come to be? KYLE ROSS: It goes back to the first time that we brought pro tennis to Vermont, back in 2007, when we had the FedCup; it was U.S. versus Russia; Venus Williams was here, we built a 4,500-person stadium, and it sold out wonderfully. The whole town got behind it and they continue to talk about it. Ever since then, we’ve been bringing people to tennis events all over the world, and we wanted to try to find a way to switch it around and host an event ourselves. It’s tough to recruit players, so, back in 2015, we partnered with Sam Duvall, who was the president of Topnotch Management, a player agency. That opened up the doors to get this going. SD: Tell me more about the legacy of pro tennis in Vermont. KR: Oh, yeah, we’ve been walking down the street, putting up banners, and there are two generations who start talking to us about pro tennis here: The older crew, 50-plus, they start talking about the Head Classic, which was back here in Stowe from 1983 to 1987, and they talk about how they saw Ivan Lendl and Brad Gilbert. And you get a younger crew. They mention, ‘Oh, I saw tennis back in the day,’ and they’re referring to the 2007 event. Tennis has a long, strong history here. SD: What makes Stowe a good host for this tournament? KR: There’s a statistic (which I have no source on) that says Stowe has the most tennis courts per capita in the world. 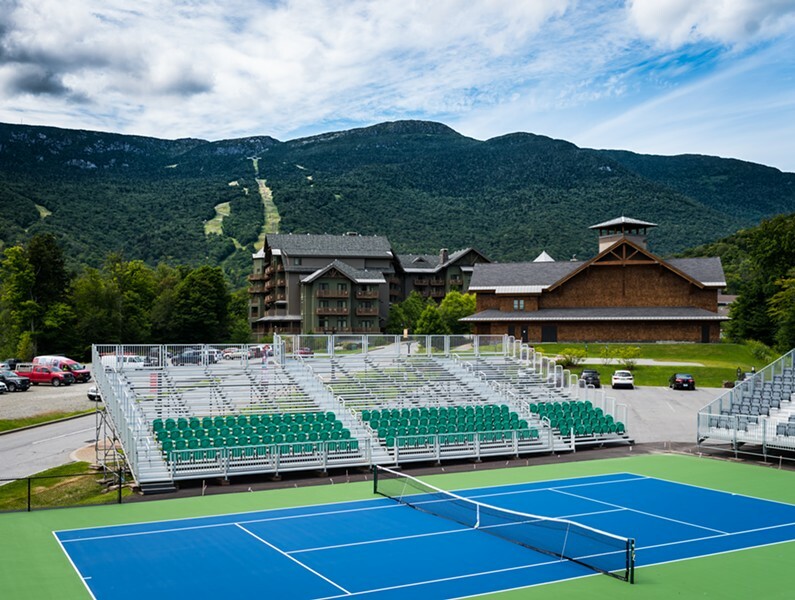 Topnotch Resort hosted the FedCup and the Head Classic … Beyond that, Stowe Tennis Club is thriving in the summer. There are a lot of private courts, as well. It’s a community where people are at leisure and they have lots of time to hit the courts. Stowe also has second homes for people [from] New York, so there’s already a little connection to the U.S. Open. People here are tennis-aware! SD: What are some of the challenges to getting this first event up and running? KR: Yeah, logistically and operationally, we were starting with a great partner in the Stowe Mountain Lodge, but there were no courts, no stadium and no players. We got the full green light on this in May — it was a late start — and then we had nothing. We were just resolving the permitting last week and the stadium got [finished] two days ago. Then we had to piece together a roster of players we could afford, and players people wanted to see. And you can only extend one offer at a time; if we extend 15 offers and they all say yes, we’re in trouble. So, you put one out, one comes back, you keep moving through, and that takes a long time. It’s hard to market an event before you can say what it is. All you have are some dates squared away on a calendar and a plan and some hope. SD: How much are you paying the players, and where does that money come from? KR: Let’s just say five figures, and it comes from our pocket to start. We’re hoping to recoup it through sponsorships and ticket sales. SD: What is the level of tennis — who are some of the players? KR: Well, we’ve got Reilly Opelka, he’s 6-11. He’s got a beast of a serve — it’s consistently at 140 [mph], awesome kid. I would put it in the bucket of world class. I mean, it’s not [Roger] Federer, it’s not [Rafael] Nadal, but if those guys have an off day, anyone at this tournament can knock those guys out. Vasek Pospisil, the No. 2 player in Canada — he won Wimbledon doubles. Tommy Haas, an older player, certainly, but he was No. 2 in the world and, until yesterday, was the last person to beat Federer. These guys devote every minute of their day to playing tennis, it’s just insane. SD: Can you tell me about the new stadium? KR: It is cool, it is intimate, it has the capacity of 2,751, and it has grandstands on three sides. We have three sections of seating, and we left one entire baseline with no stands, so you can see the court and all of the Stowe ski trails. Another section is the Spruce Peak Viewing Lounge, where you can have a drink and stand up there and look down on the court. Even the highest seat in the grandstand is considered a court-side seat at most other tournaments. You’ll get a more visceral tennis experience, you’ll hear the ball spin in the air. Most people don’t realize that, as a ball spins, it whistles. In certain sections, be ready to catch a serve. The players will be interacting in a much more casual way. It’s sweet.